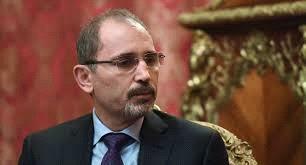 AMMONNEWS - Minister of Foreign Affairs and Expatriates Ayman Safadi Sunday confirmed the importance of the victory achieved by the Global Coalition Against Daesh terror group, and the recovery of its last strongholds in Syria. "This victory over the Daesh gang has been an important achievement for the Global Coalition and for efforts and sacrifices that have been made" Safadi said in a statement. The foreign misters stressed that this victory and the liberation of the entire Daesh-controlled territory in Syria and Iraq do not mean the end of the terrorist challenge, which still poses a security and ideological threat, emphasizing the need to maintain cooperation and coordination to defeat the terrorist group and to stop its funding resources. Jordan, he added, will remain at the forefront of international efforts aimed at combating terrorism which does not belong to any culture or religion, and contradicts our Islamic values of peace, mercy and respect for others.